Scales are probably one of the most difficult insects to control because of their protective covering. There are many species of scales, but they can all be categorized as either soft or armored. Soft scales are tropical insects and are economically more important than armored scales in the greenhouse. They are larger in size than armored scales and the protective shield can’t be separated from the insect body beneath. Soft scales have a wide host range among the bedding and foliage plants. 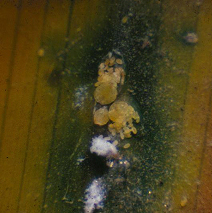 Common greenhouse scale species include the brown soft scale (Coccus hesperidum), hemispherical scale (Saissetia coffeae), and nigra scale (Parasaissetia nigra). Ferns, orchids, schefflera, crossandra, zebra plant, weeping fig, citrus, ivy and holly are the common hosts. Armored scales, as the name implies, have a hard, waxy shield. They rarely present a problem in greenhouses, but can be a concern in interior plantscapes and conservatories. Appearance: Female soft scales are what you typically think of when you think of a scale insect. They lack any recognizable body parts and are grey, brown or black and smooth and measure 1∕4 inch in diameter. Young adults are lighter in color, but soon darken as they mature. The adult male scale resembles a tiny pale gnat, but they lack mouthparts and cannot feed. Brown soft scales are oval and flattened and pale in color with a grid-like pattern. Hemispherical scales, in contrast, are circular, convex, shiny, and brown, while the nigra scale can vary in appearance depending on its host. Symptoms and Effects: Like other members of the order Homoptera, scales feed by sucking plant sap. Some scales inject toxins as the feed, further compounding the damage. Yellowed leaves and distorted foliage are indications of scale infestations. With soft scale infestations, honeydew (a clear, sticky plant sap) and sooty mold are also present. Life Cycle: Female scales produce 50 to 200 eggs or live young depending on the species. Nymphs emerge from eggs in one to three weeks. The nymph stage is called a crawler and is the only mobile life stage. Upon hatching, they immediately begin their search for a suitable host plant. 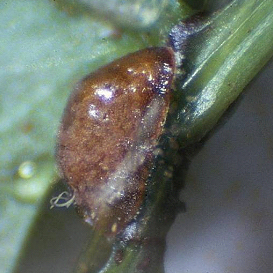 Nymphs undergo three instars before settling and a hard or waxy covering envelops the females. At this point the female’s body degenerates into a feeding sack beneath the scale cover. Scouting Suggestions: Visually inspect the lower leaf surfaces and stems for the presence of scales. Yellowed foliage may indicate that a closer look is warranted. Be sure to inspect all new plant shipments thoroughly for signs of scales. Ants may be present if copious amounts of honeydew have been secreted. Parasitized scales will be darker in color and have one or more holes in the shield. Non-Chemical: Remove and destroy all heavily infested plants. Wash off honeydew and dislodge crawlers with water sprays. Inspect all new plant material on arrival. There are many natural enemies of soft scale, but few are commercially available for greenhouse use. For information on biological control, refer to NCR publication 581 “Biological Control of Insects and Other Pests of Greenhouse Crops”. Chemical: There are several insecticides available for control of scales. Refer to UW-Extension publication A3744 “Insect Pest Management for Greenhouses” for a complete listing of available products. If there are two or more adult scales or a large number of crawlers per leaf, spot treat affected plants. You will need two to three applications at 10 day intervals to effectively control the population. If you are using natural enemies to provide some control of scale outbreaks, avoid the use of broad spectrum insecticides as these will also kill the beneficial insects. The insect growth regulators such as azadirachtin and soaps are very effective at controlling soft scales. For more information on scales: See UW-Extension Bulletin A3744, or contact your county Extension agent. Thanks to Phil Pellitteri and Lis Friemoth for reviewing this document.